I find myself browsing Sephora's website for new items pretty much at least once a day. 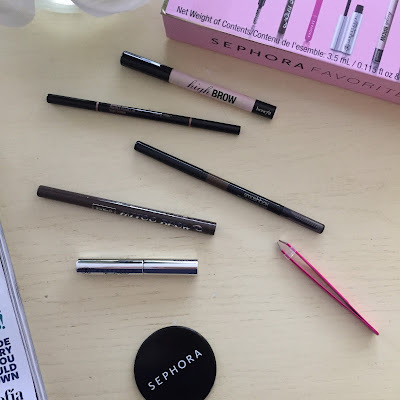 On one of these benders, I found the latest Sephora Favorites collection -- a brow wardrobe. 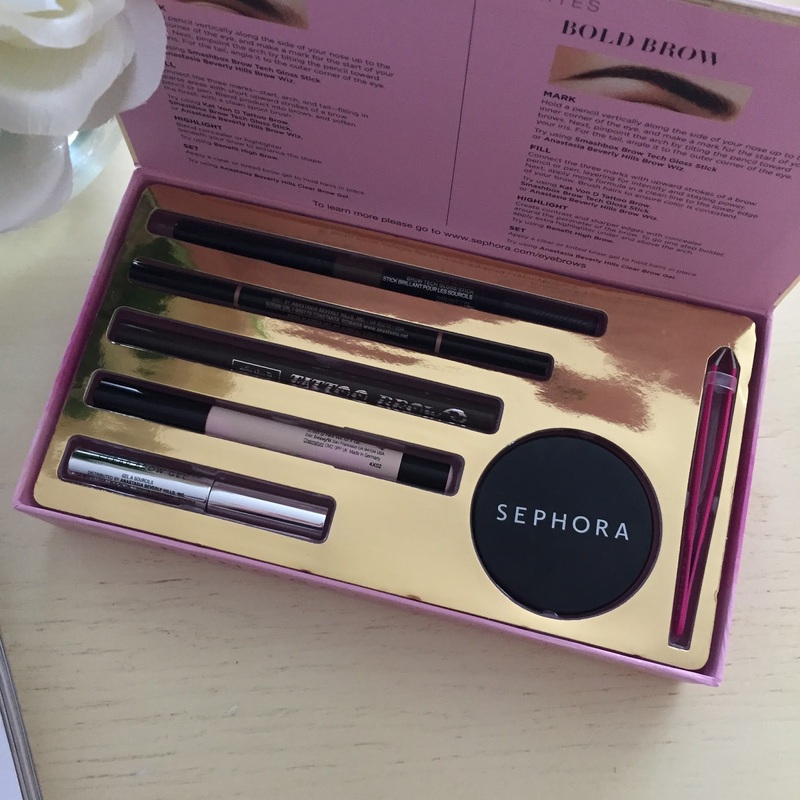 Sephora is always coming out with these exclusive kits that feature deluxe & full size samples of products. They have one for eyeliner, perfume, and had one for lips but that is currently sold out. When I saw one for brows, I was instantly intrigued. I have been meaning to get my hands on a new brow product because I am seriously lacking in that product department. The collection comes with 4 full size products, one deluxe sample, and two little bonus extras. It has a $40 price tag but the value is $102 -- that my friends is what you call a STEAL. All of these products have a nice little price tag of $20+ so I think if you've ever wanted to try at least one of these, it's worth it. That was my justification--I've been meaning to try the Anastasia Brow Wiz for over a year because it is a cult classic. The other products, the Brow Tech Gloss Stick from Smashbox & the Tattoo Brow from Kat Von D are definitely bonuses. 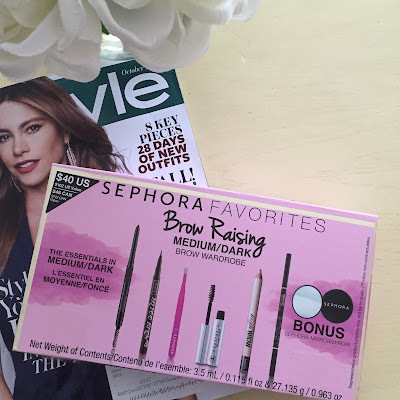 I've already used & LOVE the Benefit High Brow (a brow highlighting product) so that is definitely nice to have a back up. I also have another mini deluxe sample of the Anastasia Brow Gel so having another one of those is nice too. Throw in a pair of tweezers and a mini mirror and I'm all set! All three brow products are definitely worth the money. They fill in and define the brows beautifully. I think my favorite is the Brow Wiz (no surprise there) because it's easiest to use and control. The Smashbox pencil was definitely a little waxier and sticker than the other two but that's fine, it helps hold the brows in place. 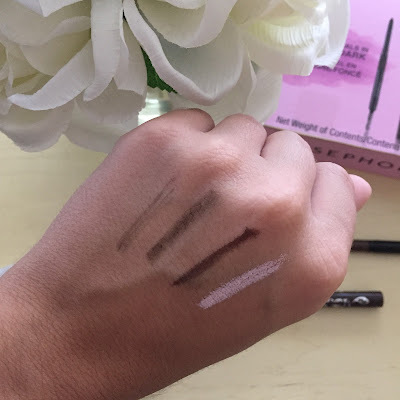 The Kat Von D liner scares me only slightly because it's a felt tip pencil, similar to a liquid liner, so at first it seemed like it would be difficult to control but with a light hand, it's relatively easy to control & use. I actually really liked the finish it gave off; thick but not too overpowering. As I said before, the Benefit High Brow is an intense pink highlight perfect for the brow bone. It makes your brows look sculpted, lifted, and super defined. It's definitely holy grail status for me. I am obsessed with this collection and it's turned me onto the other Sephora favorite collections. I think they're a great value and perfect for beginners -- yes it's a little on the pricey side but if you like trying a bunch of different products to get a distinct look, these are great kits. If you've been wanting to experiment with filling in your brows but are overwhelmed by the choices in the drugstore, Sephora, and Ulta, I would definitely recommend picking this up. The products are all similar because they're brow pencils but different enough that you could pick out your favorites. Has anyone else tried these Sephora favorites collections? What brow products are your favorite?